The market trends 1st quarter 2015 report is out. Just how is the Sun Lakes real estate market faring? This blog will give you all the information on real estate market trends in each of the five Sun Lakes communities. 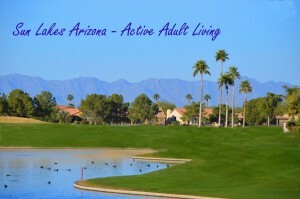 215 homes, both single family and villas, are currently actively listed for sale in Sun Lakes Arizona. That represents approximately 2% of the homes in Sun Lakes that are currently for sale. Let’s take a look at each community to see how the market is doing compared to first quarter 2014. Oakwood Country Club, the newest of the Sun Lakes communities currently has 64 homes for sale. Two of those are villas and the rest are single family homes. Through the first quarter in 2015 48 homes have sold with an average sales price of $317,766. The highest priced home that sold was for $850,000 – a rarity for Sun Lakes. This home was a two level Marbella floor plan that the owners gutted and completely rebuilt on the inside. It was truly a one-of-a-kind home with stunning golf course and water views and was sold fully furnished with high end model furnishings. The average price per square foot sold was $148.63 with average days on the market at 78. Sales to list price ratio was 96%. Compare that to 2014 when 42 homes sold, but the average sales price was a bit higher at $320,897. The highest priced home sold in the first quarter of 2014 was $510,000. Average price per square foot sold was $152.64 and days on market was 61. Sales to list price ratio was higher at 98%. Ironwood Country Club is part of the IronOaks HOA along with Oakwood Country Club. Ironwood had 11 homes sold in the first quarter of 2015 with an average sales price of $296,082 compared to 9 homes sold in 2014 with an average sales price of $297,675. The highest priced home sold in 2015 was $410,000 compared to $485,000 in 2014. The average price per square foot sold in 2015 was $142.82 compared to $133.97 in 2014. Days on market was 80 in 2015 and 91 in 2015. The sales to list price ratio remained the same at 96%. Palo Verde Country Club has seen 14 home sales in 2015 compared to 21 in 2014 with an average sales price in 2015 of $284,600 compared to 2014 at $264,329. The highest priced home sold in Palo Verde in 2015 was $375,000 compared to $410,000 in 2014. The average price per square foot sold in 2015 was $135.05 compared to $139.52 in 2014. Average days on the market in 2015 was 88 compared to 56 in 2014. Sales to list price ratio was at 95% in 2015 compared to 97% in 2014. Cottonwood Country Club is part of the Cottonwood-PaloVerde HOA and this report is for single family homes only and does not include villas. 43 homes sold in the first quarter of 2015 compared to 45 in 2014 with an average sales price in 2015 of $214,553 compared to $202,227 in 2014. The highest priced home sold in 2015 was $201,000 compared to $280,000 in 2014. The average price per square foot sold in 2015 was $120,18 compared to $117.12 in 2014. Average days on the market was 80 in 2015 compared to 42 in 2014. Sales to list price ratio is 96% in 2015 and 97% in 2014. Sun Lakes Country Club is also reporting for single family homes only and does not include any manufactured homes sold. 21 homes sold first quarter in 2015 with an average sales price of $176,774 compared to 13 sold in 2014 with an average sales price of $142,694. The highest priced home sold in 2015 was $270,000 compared to $188,500 in 2014. The average price per square foot sold in 2015 was $109.53 compared to $98.65 in 2014. Days on market were at 64 in 2014 compared to 74 in 2014. Sales to list price ratio in 2015 was 97% compared to 98% in 2014. Signs seem to be pointing toward an improving market. Sun Lakes, being a niche active adult community, doesn’t typically follow the traditional markets in real estate as quickly. Summer months are slow with approximately 50% of our population leaving for their summer homes, however we have seen the past two summers showing sales activity above normal. Inventory will begin to shrink and there is still a good opportunity to get a home bought or sold before the summer heat sets in. For more information on the community of Sun Lakes or the Sun Lakes AZ real estate market, contact The KOLB Team at 480-440-0849 or simply fill out a quick form and we will contact you.